FRAME: Full length round tube with trailer hitch and adjustable foot pegs. All gussets are laser cut. Tig and mig welded in jig fabed in house. Powder coated for durability & choice of colors. REAR END: 9" Ford. Gear ratios are optional, 350 and 370 ratios are popular. Fabed in house with new housing, tubes and big Ford axle bearings. New axles are alloy steel made to our specs. The 9" assembly is completely rebuilt using new bearings, new ring and pinion gears and seals. TRANSMISSION: GM 4L60 automatic 4-speed with reverse. Case is stripped, reconstructed with highest grade performance parts. Lock up converter is discarded resulting in smooth positive shifting. A trick “Kõpavi” gear selector rests behind left engine head for convenient access. REAR SUSPENSION: A 4-link (drag car system) with panhard bar sway bar incorporates 2 adjustable gas charged hydraulic twin tube shocks. Dual vented disc brakes with 17" wheels maintain a sensational ride with sureness and safety. GAS TANK: Aluminum 11 gallon sets inside of frame for safety and low center of gravity. Easy access simply by tilting front seat forward. RADIATOR ASSEMBLY: Located in rear, Vertical 4" core brass split tank with 3" fully enclosed shroud and 2 – 13" 1700 CFM fans. Large transmission oil cooler rest inside shroud for maximum cooling. Sensors allow fans to be activated at various temps thus retaining proper engine temperature cooling. Tubing is polished stainless steel; therefore, it eliminates rust in the system. FRONT END ASSEMBLY: Ceriani 55 mm inverted forks are used for strength and excellent quality. Custom wide upper and lower billet trees and hub are fabed from 6061-T6 aluminum with dual disc brakes. The 16" front wheel is machined to match rear wheel design. ENGINES: Chevy 4.3 V6-350-502-572 and Hemi with 4 barrel carburetor or fuel injection. 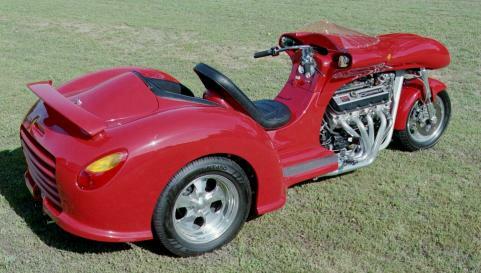 The big block Chevy’s with aluminum heads make a very attractive muscle trike. Obviously these big motors attract an abundance of attention. STEERING: Bell crank (aircraft) style with dual links to handle bars and trees. FITTINGS: Are Aircraft, bolts are coated Grade 8 and A & N washers are used throughout along with braided brake, fuel, and transmission lines. Heims joints are of highest quality. CONTROLS: Kõpavi custom chromed handle bars augments motorcycle style controls. THE RIDE: Kõpavi provides a 99" wheel base therefore providing an excellent controlled ride. The front rake is modest. With these very critical components augmenting each other there is no shimmering, shaking, or road wondering at any speed in any gear forward or reverse. When combining this excellent ride with the 4-speed automatic transmission rider skills are negligible. Ideal seating positions and adjustable foot pegs provides and extraordinary ride. BODY: The body screams style with hand laid fiberglass and inlaid cormat over drive tires eliminating road damaging stones to paint. Third brake light. Trick rear grill enhances a large locking trunk located behind rear passenger. Dual round headlights, Lexan tapered windshield with state of the art quad gauges puts one far beyond the ordinary in design and creature comforts. It is performance-oriented but docile enough so that new riders can manage and enjoy driving also. The Kõpavi Trike was designed to put you in front as a leader in style, quality craftsmanship, and dependability. enjoyed over 12,000 trouble free and comfortable miles on my Kopavi Trike. that produce the converter trike kits as well as V-8 trike manufacturers. I selected the Kopavi Trike for the following reasons. The Kopavi Trikes are different and they are made to be ridden in comfort. The rider sits very low to the ground. in almost every show I enter it in. and I don't care who I'm offending. Get yourself a Kopavi and be done with it. the thumbs up and lots of people admire and envy us. Kopavi has done a great job and we love it. with the help of the 4-link suspension. All in all there is no comparison to me as far as trikes go.